Ronald Knox, Christopher Morley and Vincent Starrett all have articles published in a 1945 magazine. Which one wrote about Sherlock Holmes? The answer: George F. McCleary. Okay, I wasn’t playing completely fair. But the statement is a true one. So, let’s start at what I suppose is the beginning, back in that war-torn winter of 1945. Encore magazine was a digest that had been around for a few years by the time the January 1945 issue rolled off the presses. It was like Reader’s Digest in size and (despite the editor’s claims) somewhat similar in scope: instead of new articles, it reprinted what the editor considered the best of the articles published in other magazines or books. Where Encore differed from Reader’s Digest is that the articles in Encore could be from historic texts as well as contemporary works. The publication was founded in Hoboken N.J., by Dent Smith. Smith apparently became ill, and the magazine was taken over by the editors of The Saturday Review of Literature. For those who have been paying attention, The Saturday Review of Literature was the home for Christopher Morley’s early articles on Holmes and the nascent stages of the Baker Street Irregulars. In fact, the tie between Encore and the BSI is evident in the first editor’s forward in the January 1945 issue. “The Editor’s Elbowroom” takes pains to pay tribute to Dent Smith and his vision for the magazine, which is to “give you a magazine you will want to read for the sheer pleasure of good reading.” The anonymous editorial writer then makes the following comparison. “We are reminded of a restaurant in New York City that seems to have succeeded pretty well in using the same general principle as applied to food. Maybe you’ve heard of it. It is owned by one Chris Cella. About fifteen years ago, Cella had an idea that had apparently never been tried in the restaurant business. Almost everywhere he went in search of food, he found magnificent edifices, magnificent soft-toned mirrors, magnificent indirect lighting, magnificent chromium fixtures, and magnificently printed menus with a magnificent listing of not-so-magnificent grub. As any baby BSI can tell you, Chris Cella’s was a favorite haunt of Christopher Morley and his fellow writers in the proto-BSI era. It was also the home of the first meeting of the BSI in June 1934. The Sherlockian connections grow as you look through the issue. 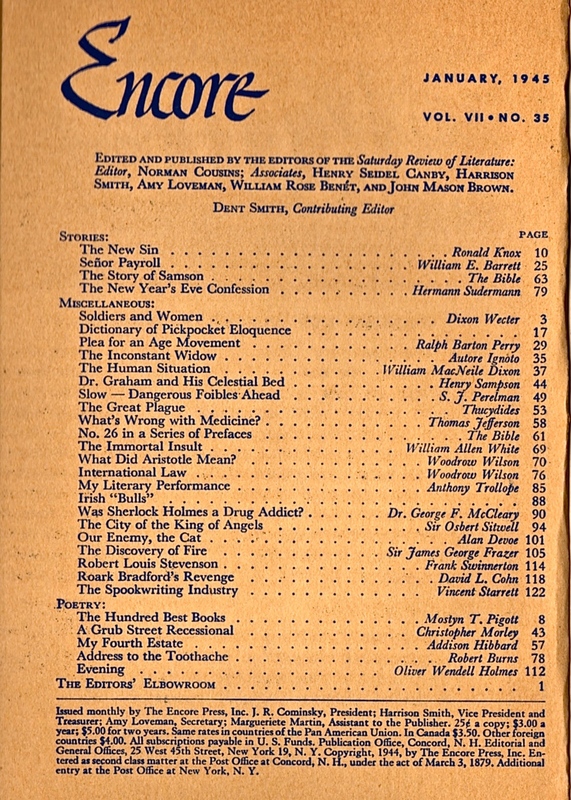 Father Ronald Knox’s contribution in this issue of Encore is “The New Sin,” an essay that was part of his anthology entitled Essays in Satire, published in London in 1928. Included in the anthology was “Studies in the Literature of Sherlock Holmes,” an article written by Knox in 1911, and beloved by many for its use of the Holmes stories to tweak German theologians. Speaking of Christopher Morley: His contribution is one of his better known verses: “A Grub Street Recessional.” The poem has been reprinted often, and was included by Morley in his 1921 book of poetry entitled Chimneysmoke. Dr. George F. McCleary's contribution to Encore. But what of the Sherlockian essay? This came from Dr. George F. McCleary, who had served as Deputy Senior Medical Officer of the British Ministry of Health. A casual Sherlock Holmes devotee, McCleary’s article on Holmes’ addiction was first published in the prestigious British medical journal, The Lancet, then reprinted in Profiles by Gaslight, edited by Edgar W. Smith, in 1944. Was this a coincidence or is there a Sherlockian mind behind this stellar cast of writers? As Harrison Hunt has pointed out, it was most likely not Morley himself. By this point, Morley had moved on from his regular work at The Saturday Review of Literature, so it is unlikely he had a hand in the making of this issue. Still it is curious to note the connections here. We ask again: Was there a master hand at work? And if so, who dun it?